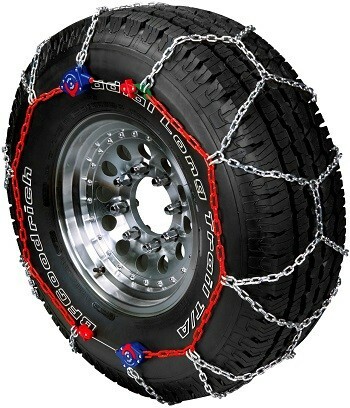 Peerless 0232805 Auto-Trac Light Truck/SUV Tire Chain is a versatile traction chain that can be used to provide premium traction and a smoother ride. 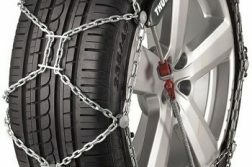 These self-tightening chains can be utilized for both icy road surfaces and pavements. One can drive up to a speed of 30mph with these chains on. They come in pairs and are equipped with everything that you would require for the installation and usage such as a pair of gloves. These chains meet the Class ‘S’ clearance requirements. They are easy to store and collapse nicely. They come with hassle-free self-tightening ratchets. These rackets are dual high-impact polycarbonate rackets which help in automatic tightening and centering. 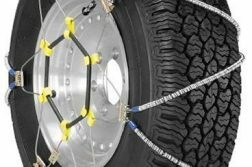 As a result, it is quite easy to install and remove the chains during times of need. These polycarbonate rackets also help in eliminating loose chains and re-tightening stops. There is an installation guide where all the six steps are clearly explained, thus enabling you to complete the installation process in a jiffy. The instruction manual is also water-proof so that you can put it down on the snowy surface and go through the steps at ease. The color coding makes the installation further easy. The traction offered by these chains is excellent. You can enjoy the benefits irrespective of whether you live in the desert or snow covered areas. The auto-tightening feature is also fantastic. It comes handy for the areas where the gaps are automatically sucked up. They also offer you a great ride and the diamond pattern gives them an edge over the conventional radial pattern chains. 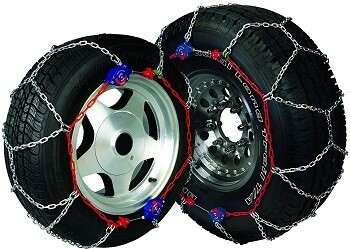 Also, the chains being light, it is easy to drive the vehicles in a hassle-free manner for anyone. The overall experience is much better than that in the other diamond pattern cables or V-patterned chains. A few users have experienced problems such as dysfunction of the take-up mechanism of the ratchets. One of the chains may be found to flop around and hit the liner of the wheel well. The excess cables in the device can’t be forced to work. So, the chains will be found to be of no use once the ratchets stop working. The tensioner is not replaceable. A disadvantage since customers would prefer to replace the tensioner whenever required. 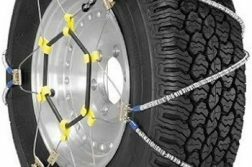 The Peerless 0232805 Auto-Trac Light Truck/SUV Tire Chain is a versatile chain which is one-of-a-kind with great usability. One can easily install them while driving on snow-covered roads, deserts or even pavements. There are a few disadvantages such as the fault in the take-up mechanism, but these are negligible compared to the amazing features offered by the chain. It is thus a great chain, and the handful of negatives can easily be overlooked.